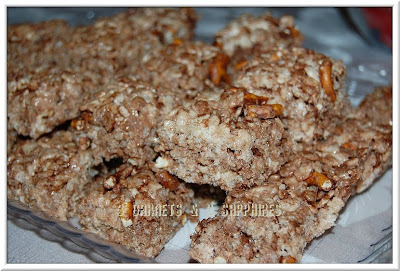 Recently, I took part in a challenge to create a Rice Krispies Treats recipe especially for back-to-school. One of my original ideas for a salty-sweet tasting treat was to use chocolate-covered pretzels instead of the chocolate covered peanuts I ended up with. I chose the dark chocolate variety of chocolate-covered pretzels because I thought milk chocolate might be too sweet in conjunction with all that marshmallow. There are many other kinds of chocolate-covered pretzels you can try in place of the dark chocolate, if you like to experiment. Step 1. Lay opened bag of chocolate-covered pretzels flat on a cutting board. While holding the opening shut with your hand, use a mallet to break the pretzels into small pieces while still inside the package. Step 2. In a large saucepan or skillet, melt the butter or margarine over low heat. Step 3. Add mini marshmallows and stir continuously until completely melted and blended with butter. Step 4. Add Rice Krispies cereal and then the chocolate-covered pretzels. Step 5. Remove the pan from heat. Then stir until the cereal and the pretzels are completely coated with the melted marshmallow. Step 6. Transfer entire mixture into a 13" x 9" baking pan, casserole dish, or plastic storage container coated with nonstick cooking or baking spray. Step 7. Using a folded piece of wax paper, press the mixture into the pan, packing it as evenly and tightly as possible. Step 8. 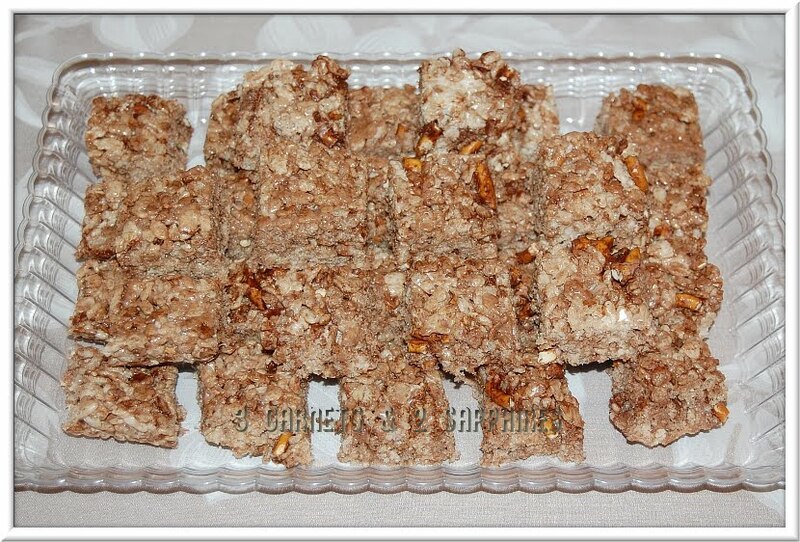 Allow the pan of Rice Krispies Treats to cool completely before cutting into 2" squares. Store your treats in an airtight container. It is best if they are consumed within 2 days or so.